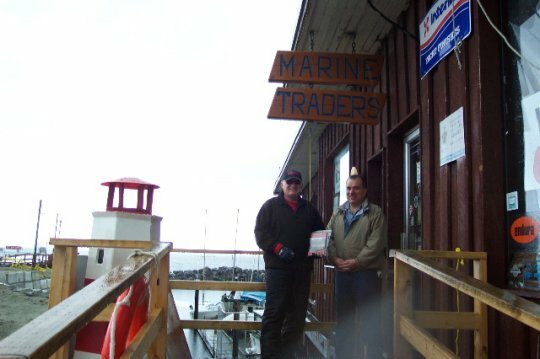 Marine Traders' Jim Coulton (right) and author Wayne Lutz pose for the camera on the first day of Up the Lake's retail introduction in Powell River. Marine Traders is the scene for several stories in the new book, and you'll probably identify these if you are a customer of this well-known store at the entrance to the ferry dock. Jim's encouragement in Up the Lake's introductory marketing campaign has been an important part of the book's regional success.